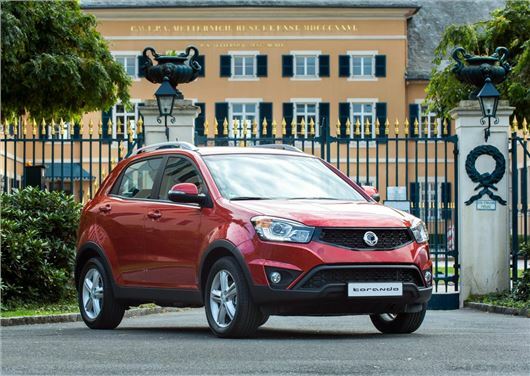 The facelifted SsangYong Korando is available to order, with first deliveries expected early in the New Year. The updated car gets a new interior layout, a restyled exterior and improvements to refinement. Prices for the facelifted model start at £14,995 for the two-wheel drive manual in SE trim, rising to £21,496 for the all-wheel drive ELX4 automatic. All models are powered by the same 2.0-litre diesel engine, which is offered in two states of tune – either 149PS or 175PS depending on which trim level you choose. The engine offers a decent peak torque output of 360Nm and consequently the car has been commended by The Caravan Club for its towing ability – it has a 2.0-tonne braked towing rating. Externally the front of the car gets a comprehensive makeover, with new headlights and a new grille. The cabin has been reworked with more upmarket materials, including wood inlays and soft-touch plastics. Thanks to improved soundproofing and revised engine mounts the updated Korando is quieter and more refined than before. We’ve had a chance to drive the updated Korando. Click here to see what we thought.